Nathan, a native San Franciscan for over 44 years, now living in Marin County, is a self taught photographer who uses a variety of techniques— including long exposure, infrared and intentional camera movement— to express his unending wonder of the fundamental fact of existence by attempting to focus on the silence that we can sometimes perceive in between the incessant waves of sound that often dominate our perceptions of the world. Nathan’s long exposure seascapes focus on the Pacific Ocean coastline, from as far south as Monterey County and as far north as the Oregon coast. 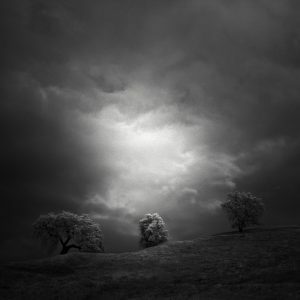 His infrared work has primarily been captured in the dairy farms and rolling hills of Marin and Sonoma counties. Nathan is the author of, a slice of silence conversations about photography, a blog that focuses on monochrome, long exposure photography but also covers different styles and techniques. His blog shares some of the amazing photography he encounters through interviews with and spotlights on both established and emerging photographers. Nathan teaches English at City College of San Francisco.